Price includes printing, double tabbing, processing one mailing list, Presorting and USPS documentation, inkjet setup/addressing, and delivery to Post Office. Processing additional lists, list purchases, postage, and any rush fees are not included and are calculated separately. Please Note: POSTAGE COSTS CANNOT BE REFUNDED FOR ANY REASON ONCE A JOB HAS BEEN MAILED. When Will I Get My Folded Cards with Mailing Services? 10,000 or fewer Folded Cards with Mailing Services: Dropped at the Post Office 4 business days from proof approval. Over 10,000 Folded Cards with Mailing Services: Dropped at the Post Office 7 business days from proof approval. Inkjet only orders 10,000 or less ship or are ready for pickup 4 business days from proof approval. Inkjet only orders above 10,000 ship or are ready for pickup 7 business days from proof approval. Folded cards are perfect for invitations, announcements, greeting cards and more. Optimize your time and your savings with your next folded card printing and mailing project by using 48HourPrint.com. Place your order and trust that the online printing services from 48HourPrint.com will deliver more for your money with our high quality folded card printing and mailing services. 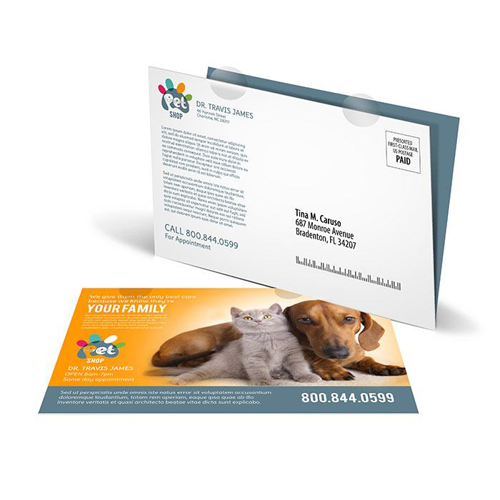 Streamline the direct mailing process when you use our combined folded card printing and mailing services. 48HourPrint.com’s state-of-the-art mailing facility takes care of the process for you, delivering a complete mailing service solution that costs less and is more efficient than if you did it yourself. You save money with discounted postage rates and save time by not dealing with messy labels, sorting folded cards, or making Post Office deliveries. Let our folded card printing and mailing services make life easier. Whether we are printing and mailing folded cards to your mailing list or you rent a mailing list from us, you can take advantage of our high quality folded card printing and mailing services. Submit one or two folded card mailing lists or rent a residential mailing list or commercial mailing list from us. From the time of your proof approval, it takes only four days for your folded cards to be printed, addressed, sorted and at the Post Office ready to mail. It’s that easy! In addition to folded card printing and mailing services, we also offer single fold brochure printing and mailing services, tri-fold brochure printing and mailing services, and postcard printing and mailing services. 48HourPrint.com is your trusted printing and mailing resource. Preserving the environment is important to 48HourPrint.com. Our folded cards are printed on recycled cover stock, which delivers excellent folded card printing results on stock that is brighter and more uniform in color. Recycled cover stock is our standard stock, at no extra cost to you. All scores and folds are included at no charge. Our two-sided folded cards are printed in full color on 14 point cover stock with your choice of matte coating, gloss coating, high-gloss U.V. coating, or C1S (coating on the outside and no coating inside for handwritten or inkjet printer messages). C1S is best for adding handwritten messages. For promotional tips on using folded cards, check out our folded card marketing ideas and folded card mail marketing ideas. Also review our folded card templates for layout guidelines that will help keep your print and mail job on schedule.